wow those washcloths are awesome. I am sure your co-workers will love the feel of these. You've done good! 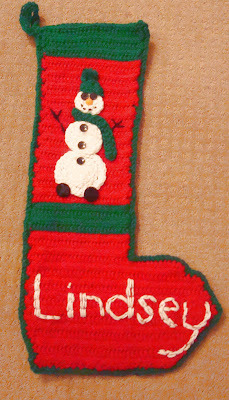 I love the stocking so full of love and I'm sure she will too. What a great idea for your co-workers. Have a great Christmas! Oh, I know she will love the stocking and I just love the idea for your co-workers, I may have to steal that for next year!! You have the neatest ideas! Unfortunately for me, I don't know how to knit, but someday..... You have given me so many idea for practial homemade gifts for next year. Perhaps I had better start now or I'll be like you still trying to finish up the day before Christmas! LOL. Take time for yourself, you really deserve it. Really cute, what a sweet husband and what a good friend you are. Have a very Merry Christmas Nanette. Thanks for the gift of inspiration and encouragement all year. I do the same thing - plan to make one a week of something so I won't be rushing at the end. Never works! LOL Here I am still scurrying at the last minute. You all have a Merry Christmas!! You always have the cutest knitting projects. These are very good ideas!! I knit some back scrubbers and gave them with soap! They turned out adorable - and don't you know I did not take the first photo! 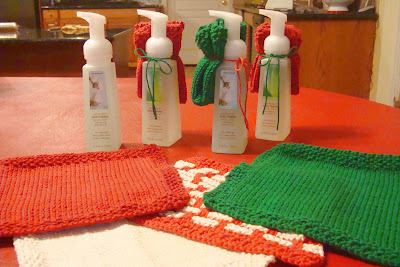 i love the idea of giving the dishcloths attached to the soap! such a great idea! I love your washcloth/soap idea; it lets others know you are thinking about them without it being costly. Daytime here - we have had a lovely breakfast and now thinking about lunch - two DD's are entertaining today so that's lovely! You will have to tell us about your washcloths - for the body or dishes? - what sort of cotton etc. They look great! What lucky co-workers you have!! You are so wonderful! I hope you had a Merry Christmas! Very nice! Did you know that when those soap dispensers are empty, you can just add about 2T of body wash and fill the remainder with water to make a new batch of hand soap. It's frugal and so nice to have your favorite fragrance as well! But I love the clothes the best!